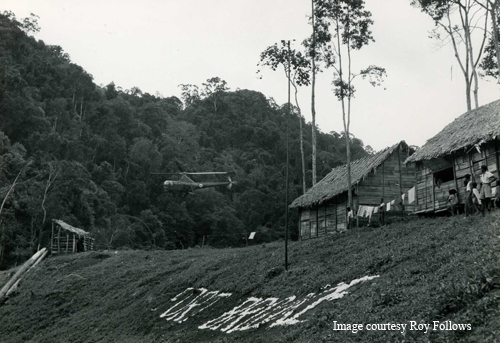 If you have read the page on Police Operations, you will be particularly interested to read this fascinating account about a 'camp' or 'fort' that was home to a Malay Police Platoon during those perilous Emergency days. 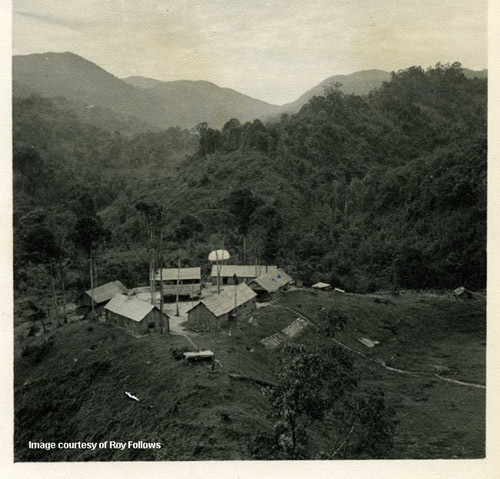 Roy Follows led that Malay Police Platoon and he has kindly sent us some evocative images of the fort which became such an important part of his life - and of his survival. By way of introduction, Roy spells out very briefly the reason for jungle forts and the important part jungle forts played in defeating the CTs. 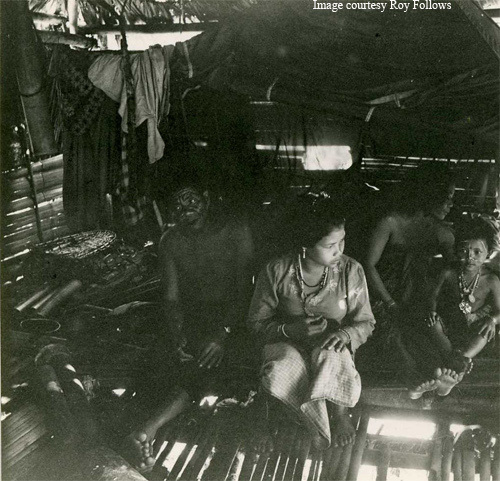 The Aborigines, orang Asli, lived in deep jungle and were made up of several different tribes, and had been under Communist Terrorist (CT) control. 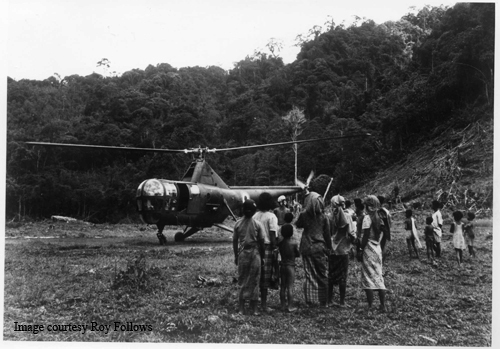 The CTs had even had their own Aborigine/ orang asli organization since the Japanese occupied Malaysia during WWll, when the communist led 'Malay Peoples Anti Japanes Army' ( MPAJA ) first coerced them. The Aborigines not only grew food for the CTs, they were also their eyes and ears, alerting them if security forces were in the vicinity. To try and break the hold the CTs had over the Aborigines, it was decided to build forts in deep jungle. From these remote and isolated outposts, contact could be made with these little known jungle tribes, and thence destroy the propaganda and lies with which the CTs had been brain washing them for years. 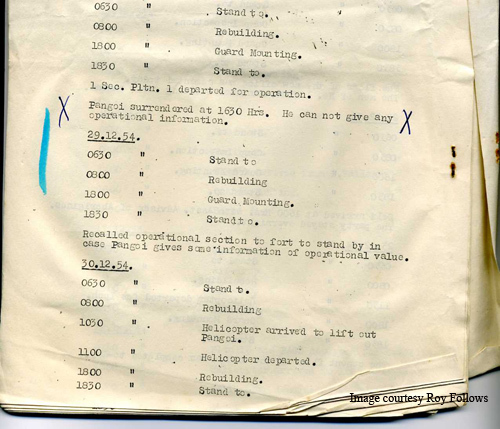 Such little things as - Should they see an aircraft flying overhead, the CTs would tell them it's one of theirs. Having no means or reason to dispute this, the Aborigines believed them. Also whereas before security forces had a several days trek to reach their operational area, now they had deep jungle bases, where they could be airlifted into and from where they could operate." And so the forts came into being and became one of the security force's most important strategic bases. They were dangerous places. 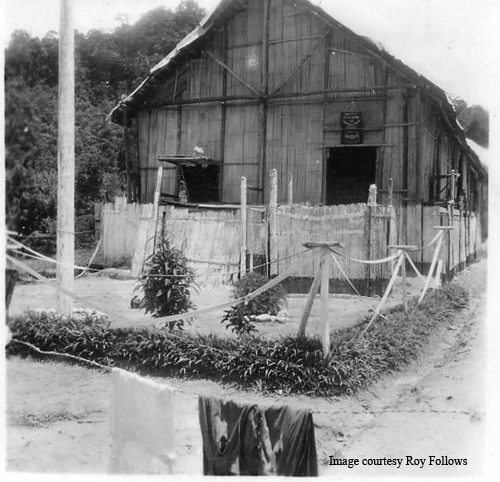 Fort Brooke was one of those forts and it was from there that Roy Follows and his platoon of Malay Police operated so effectively against the Communist Terrorists. "Barry. 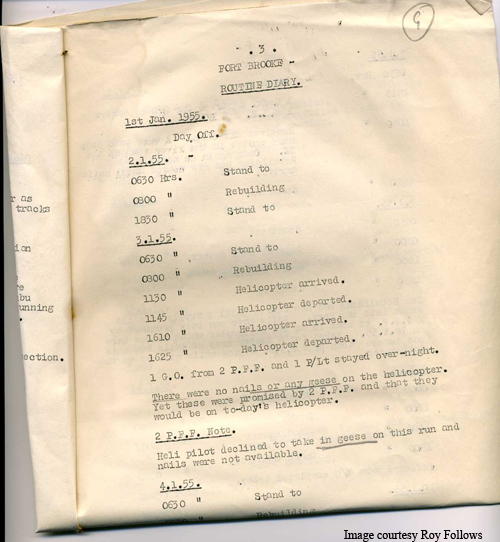 Please find photographs of Fort Brooke, along with supporting information including my original operational map of which you will see shows the region being a little somewhat hilly! To make life a little more exciting, the uncharted area on the map was little known, and an ideal place for me to play at explorers. 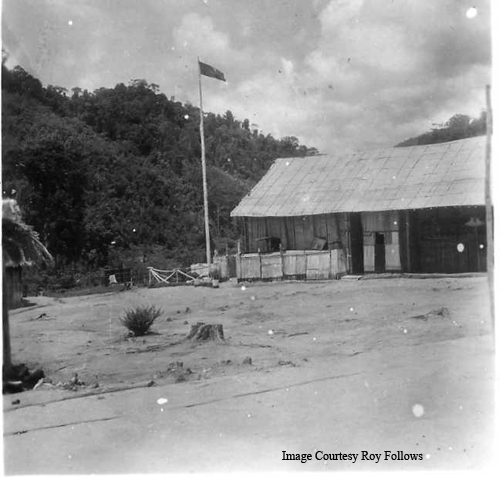 Fort Brooke of where I took over in Oct 1954, was one of ten jungle forts all of which were under the command of an officer of the Malaysian Police. The most northern one was Fort Kemar then moving south, was Ft Chabai, Legap, Brooke, Selim, Telanok, Dixon, Shean, Langkap and Iskander which was in north Johore. Fort Brooke was built by the SAS along with men from a police jungle company. 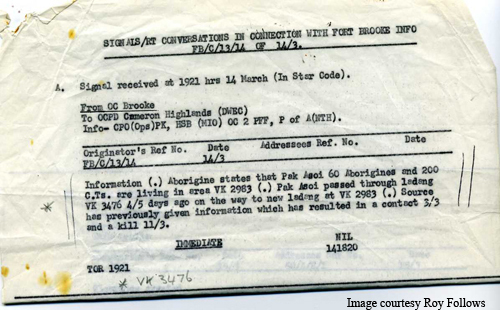 It was name 'Brooke' after the then CO of the SAS. 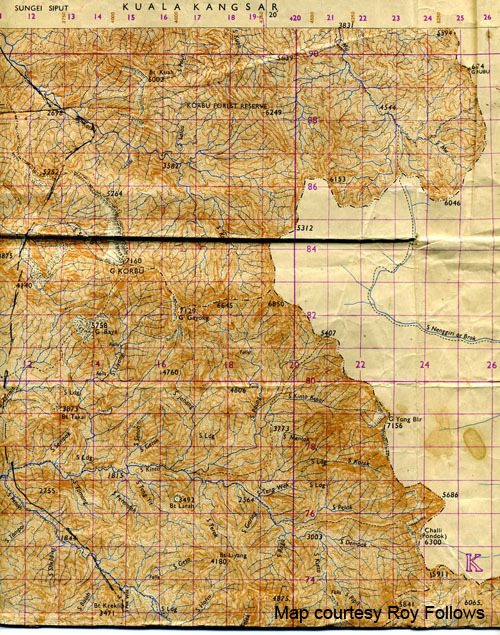 Although some forts boasted an air strip on which 'Pioneers' could just about land. 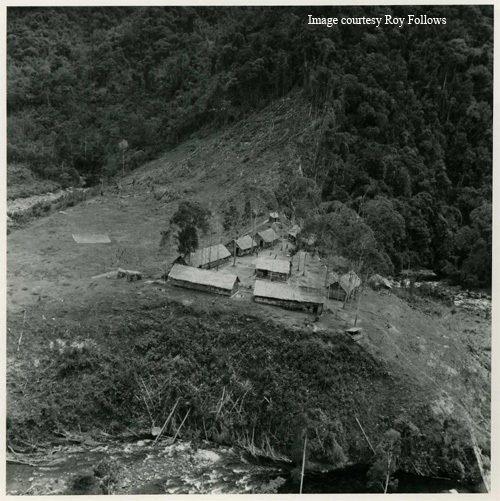 Fort Brooke ( 2,500ft asl ), being positioned in the mountains, only had a dropping zone/landing zone (DZ/LZ) to take air drop supplies and helicopters. It was garrisoned by Police from a Jungle company/Field force force, who also carried out operations from the Fort. This meant the fort was sometimes full, on other occasions I'd be left with only just enough men to guard the place. Three Bren Gun posts at vulneral postions were manned 24hrs a day. Stand to was carried out at each dawn and dusk, and no one moved far without their automatic. 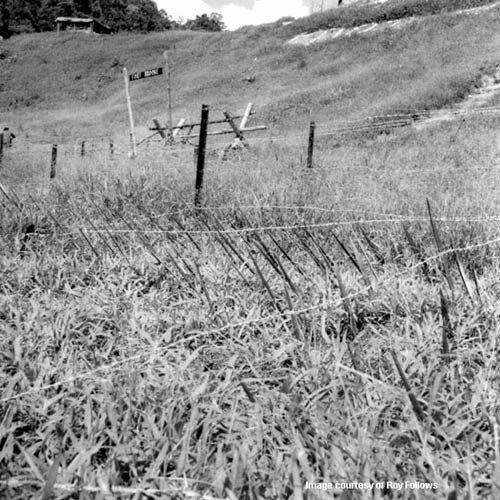 The complete fort was encircled by a belt of horizontal barbed wire which was only about 2ft high, but 12ft or more wide. Amongest this barbed wire were thousands of sharpe bamboo panjis, set in the ground at 45 degrees with 18 inches protruding, ready to impale. But should the fort come under attack, I had 'asssurance' (some hope) that if it was being over run, I along with a radio operator, plus transceiver were to make our way to a block house in the centre of the fort - a bit of concrete in a bamboo hut - where all I had to do was repeat over the radio the code words 'Operation Medal' , and this would trigger off an airborne recapture - just like that. 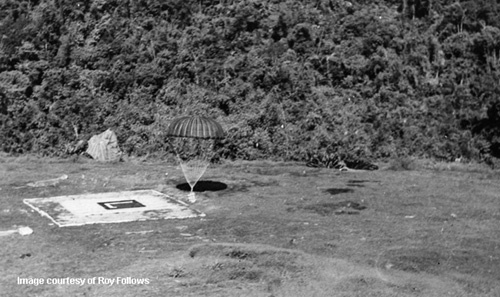 Often through fog the weekly air drop to the fort was put off, some time for several days, so I doubt if paratroopers could drop in more or less straight away. And I don't think for one minute they had them standing by just in case. I was going to explain why the fort and what was my main job there, but I think there's enough here already for you to edit without any more. Here are six pics I have more should members wish to see them. Should you wish to ask me any questions about the fort I will be only too please and try to answer them. Trust you are well. Best wishes Roy "
Here are the six images Roy sent. 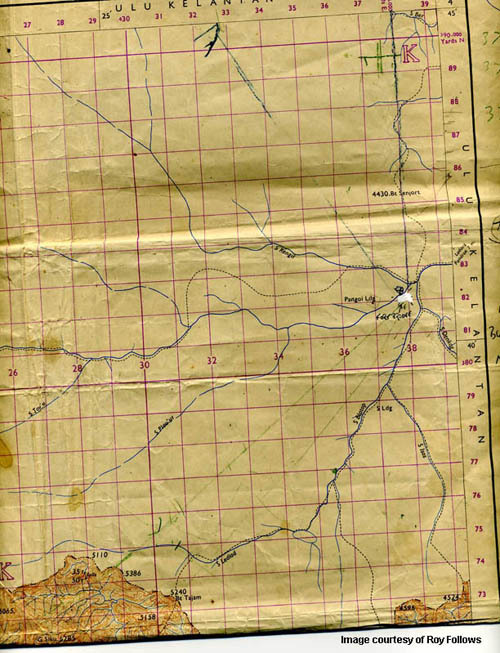 Part of an Op Map of the area of Fort Brooke. Note how much is uncharted. 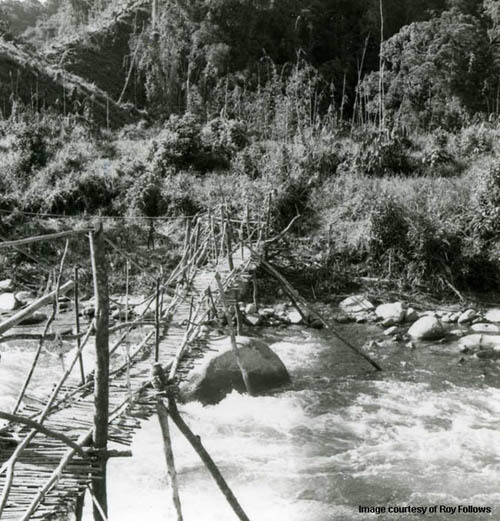 Bridge spanning river into Fort Brooke. 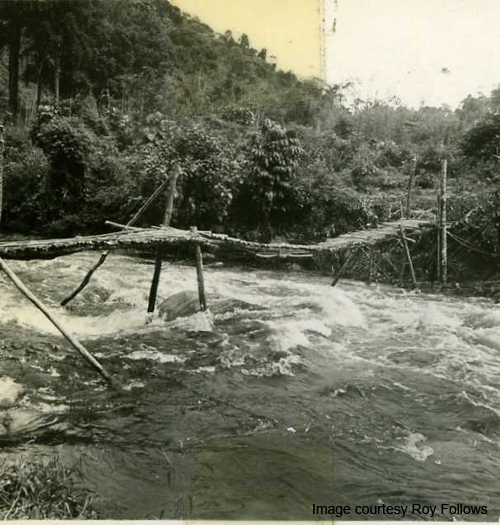 The bridge was always being washed away. Barbed wire and panjis offered some defences around the Fort. Off target! The drop landed inside the Fort instead of on the DZ. When this happened it caused much damage. Roy has sent these brief notes on some of his memories about life in Fort Brooke. They will ring many bells for some of us. "My main job as Fort Commander was to win over the hostile Aborigines / Orang Asli tribes, who were under communist control. As well as always watching my back, what made the challenge more difficult, the Department of Aborignes KL had little idea to how many of these little know jungle people were living in the region. Locked in their deep jungle valleys, stranded in a stone age time warp, these tribes (Temiar) had, through circumstances outside their control, been by passed by western 'civilization'. Grubbing out an existence in the jungle, they had no idea of time, distance, miles, yards, numbers (a few could count to three). This meant they could not tell me how far it was from one place to another - also, how many CTs were in the camp when they came across one. When staying over night in a tribal longhouse they, having never seen such things as Tommy cookers, canned food, torchlight etc. would marvel at such items as I took them from my rucksack. With regards to the defences of the fort, no one moved far without their semi-auto. Stand to was, without fail, carried out each dawn and dusk. Three strategic Bren Gun positions were manned 24hrs a day. A number of 2/3 trenches circled the fort where, in the event of an attack each man knew his allotted position to take up. Also for immediate use if needed, I had a large supply of No 36 grenades always close at hand, plus a small mortar - size 2'' from memory. 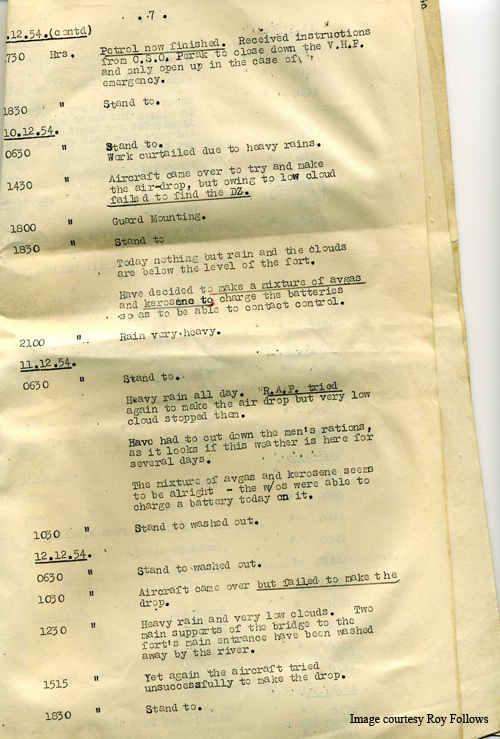 Other than for a small petrol generator used to power the transmitter/receiver in turn used to keep in contact with the outside, ie, patrols on ops, speaking to crew of supply a/d aircraft, and the hourly 'Alls Well ' schedule to HQ etc, there were no such luxuries in the fort as electricity. For lights it was a case of groping around in the dark with a temperamental oil lamp or candle. 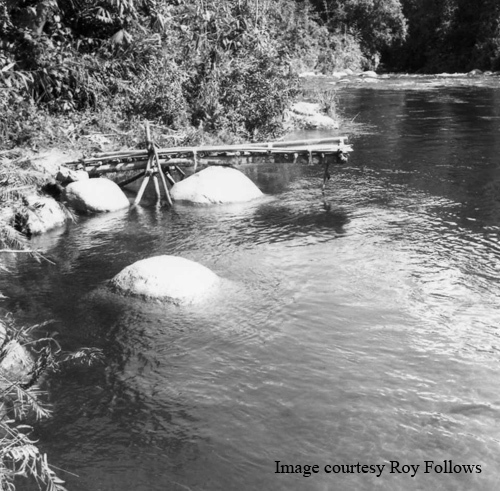 Water for cooking came from the nearby river and was carried in several two foot long pieces of bamboo tied on the back of an Abo who made many trips back and forth from the river to the fort. I had three 'Gunga dins' whose job it was to keep the forty gallon former oil barrel filled with water. Not only did Abos carry water, I employed them doing all kinds of work in the fort . But with them having no idea about money /coins, I paid them in beads, rock salt, and loose tobacco, all of which was supplied by HQ. The same river was my bathroom and, whenever I took a bath, I never went with out my semi. Air drop supplies arrived once a week with the items I had to request at least three days in advance. Everything from barbed wire , JGs (jungle greens), J boots (jungle boots), crates of rations including one day of fresh food meat/ chicken. Nails, tools paraffin , petrol, roofing felt, cement. You name it , the RAF / 55 RASC dropped it in. Personal items, although permitted, were restricted. All I used to ask for was a weekly bottle of Scotch and toiletries when I needed them (no toilet paper, shampoos etc ). A couple of times the parachute/s carrying the crate containing my Whisky failed to develop crashing into the ground shattering the bottle of Scotch!" A Platoon Commander inspecting his platoon before starting patrol. One of the three Bren Gun postions. Map showing area west of Brooke. Note the high ground. 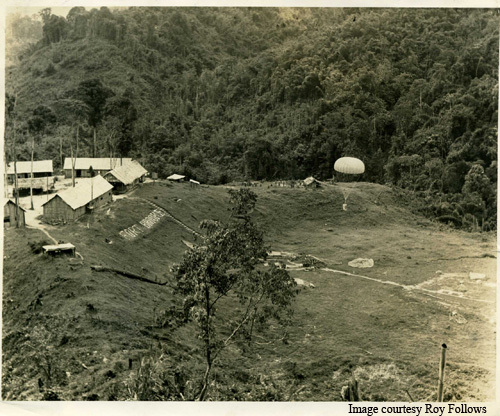 Because of this and when low cloud, which was often, ADs (air drops) to the Fort had to postponed. Same Bathroom different angle - my Carbine was always close at hand. Helicopter approaching LZ (Landing Zone. The Aborigines had seen helicopters, but not yet a bicycle. Another view - Guard Room Fort Brooke. Roy continues his story of Fort Brooke with these memories of his fight against local Connunist terrorists led by two leading CTs. 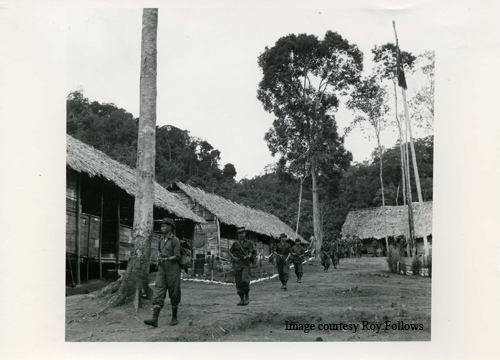 The key point is that Fort Brooke was deliberately situated right in the heart of enemy-controlled territory in order to enable Roy and the Malay Police Platoon he led to win over local hearts and minds and to track and attack the enemy suddenly and from close proximity. “Not only had I to try to 'win over' the hostile Aborigine tribes, but to speed this up. 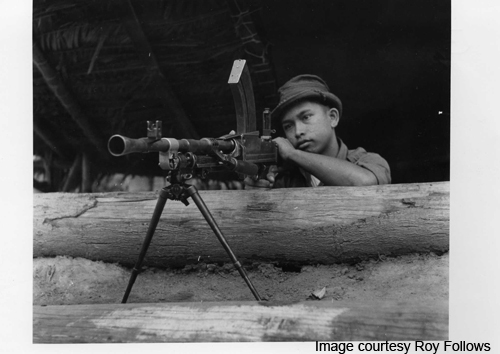 I also had to try and 'neutralize,' two senior Communist Terrorists (CTs) who each, with their armed units, controlled the Aborigines in the area. 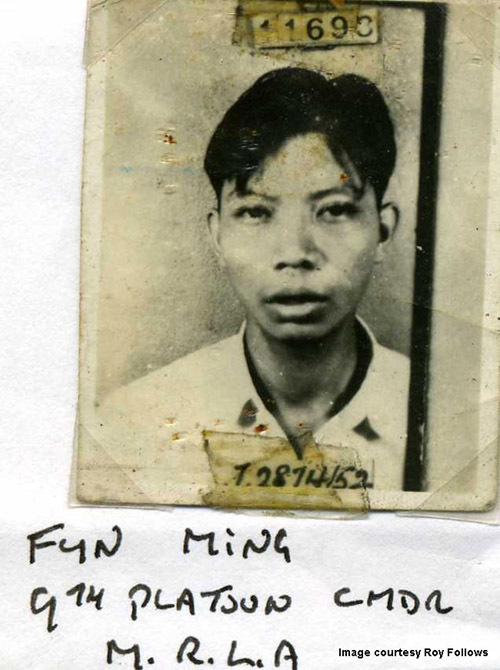 One with the theatrical name of Fun Ming (no relation to Ah Ming, Commander 9th Platoon Johor whose photo I've already shown) was in charge of the CTs Asali - Aborigine organization - for the whole region. 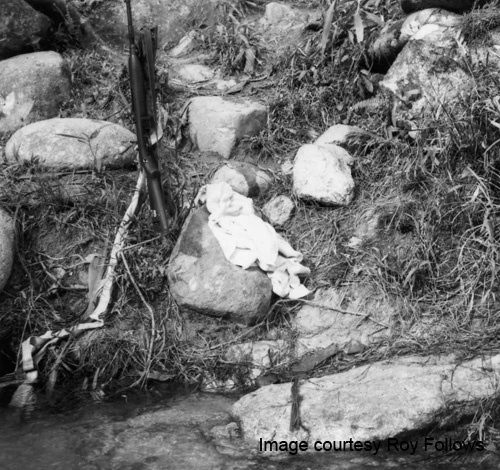 The other was Pangoi, a domineering tribal headman who, it was claimed, had along with Fun Ming been involved in a number of ambushes against the Security Forces (SFs). 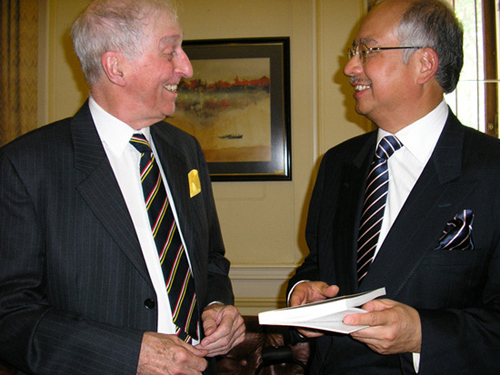 Fun Ming and Pangoi, having known each other since before the emergency, had become firm friends over the years. Consequently Fun Ming, through having such a powerful ally in Pangoi, gave the CTs control over the Aboriginese. One thing to my advantage was that Pangoi’s tribal settlement was only a few miles west of Fort Brooke, and most days some of his people, including his son Uda, would come into the fort. Using his son as a go between, I would send Pangoi small gifts, usually of tobacco, along with a verbal message suggesting that we arrange to meet. Also with his ladang (Aboriginal tribal settlement consisting of about four or five longhouses) being not too far away, with a small patrol I did make a couple of surprise visits there, in the slim chance of 'nailing' him. But each time we arrived there, we found the place had been quickly evacuated. We also knew that as we made our way amongst the empty longhouses, unseen eyes were watching our every move. What added to this eerie tension, was that I aware that Fun Ming and his unit were regular visitors, and Pangoi’s men had number of firearms, as well as blowpipes that deliver a near silent poisonous dart - there was no known antidote to that poison, and death took an agonising hour or more. With this in mind. and being only a small patrol I would pull out. Please find more photographs for the Fort Brooke series. You will see that I've included pages from the Fort’s monthly report which give the reader a snap shot of what life was like there. I record heavy rain, everywhere sodden, no AD (Air Drop), running out of food, no petrol for the wireless generator, etc etc. In fact it was not just a normal tropical downpour which are bad enough, this was a typhoon where the rain came in at near horizontal and, together with the violent wind, wrecked part of the fort. I have pics of the rebuilding. To keep the wireless generator running you see that I mixed aviation fuel with paraffin. I took this during the same AD (Air Drop), but a few minutes before taking the photograph where the parachute is shown missing the DZ and landing in the middle of the fort. 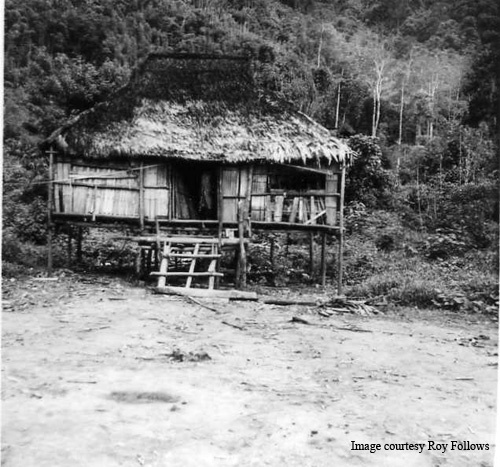 Pangoi's Longhouse .Having been alerted of us approaching, his landang would be deserted. Although I visited his ladang a few times but, with him and his tribe not being there (hiding watching us from not far away ), and I having no rights to do so, I never set foot inside his house. 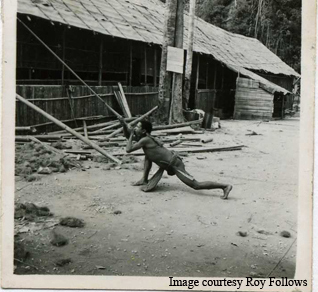 A Temiar tribes man demonstrates his blowpipe skills. The poison is obtained from the Ipoh tree. 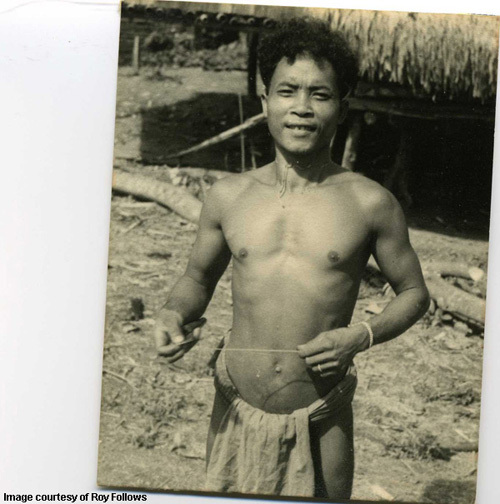 According to the Temiar, the soil under the branches of this tree is contaminated with poison, so no other plant will grow there The blowpipe is made from a rare specie of bamboo i.e. whereas most bamboo have sectional nodes along its length, 'blowpipe' bamboo does not. A blowpipe, along with a quiver of poison arrows, was given to me by a headman. I still have them - the blowpipe is about 7' long, with the poison arrows between 7'' to 8'' in length. Shortly after Pangoi surrendered to me. The group shows myself together with Pangoi along with three or four other headmen from local tribes. Inside an Aborigine longhouse, the sort where I would spend the odd night. This one of the fort shows its triangular shape - at each of the three corners was a Bren gun position. 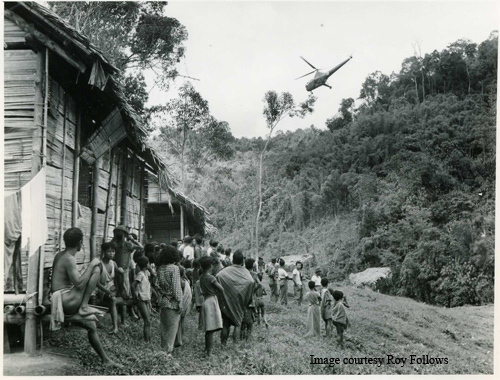 Outside my bamboo shack Aborigines watch helicopter depart the fort. Type Dragonfly or Wessex ? I am not sure. Helicopter on L Z. I have others taken of helicoptors but for another time. Info about a strong force of CTs being nearly at my back gate! With you being Int Corps [Roy refers to BarryF], it maybe of interest to you. 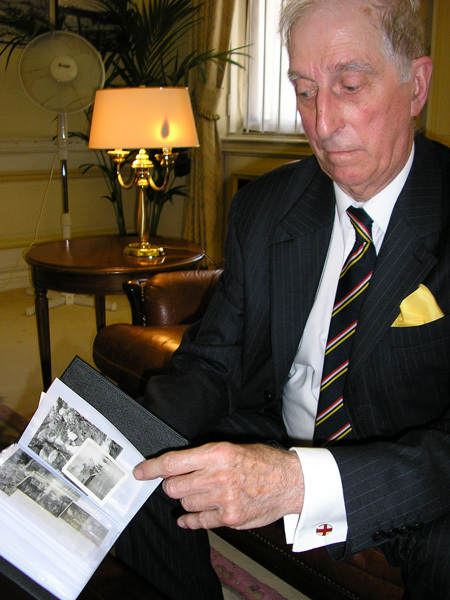 Roy and some of his memories. 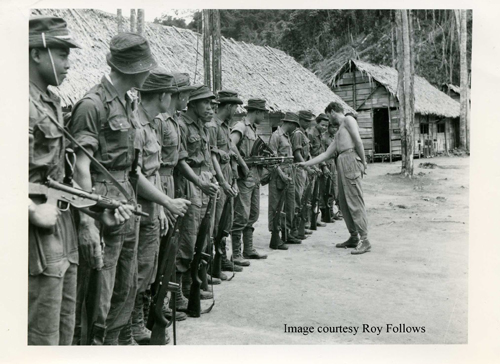 If you want to know more, read Roy Follow's book "The Jungle Beat - Fighting Terrorists in Malaya". Better still, take part in one of our Competitions and win a signed copy! Another evocative book that we think will bring back many memories is "The War of the Running Dogs" by Noel Barber.